Memorandum Jan. 1866 Sun. Jan 7 I went to church. Elder Faucett preached. At Berguins gave Hannah card &c at S. School Wm. Ottoman there at prayer meeting in evening Miss Raymond gave me her picture Mon 8 Wrote out Lease for (Dru??) C. Ensign & Wm. Ottorman here (C. S. Bookman agrees to give 55 Doll. for the 1/4 of Beers house Drew some things from store (Dru??) 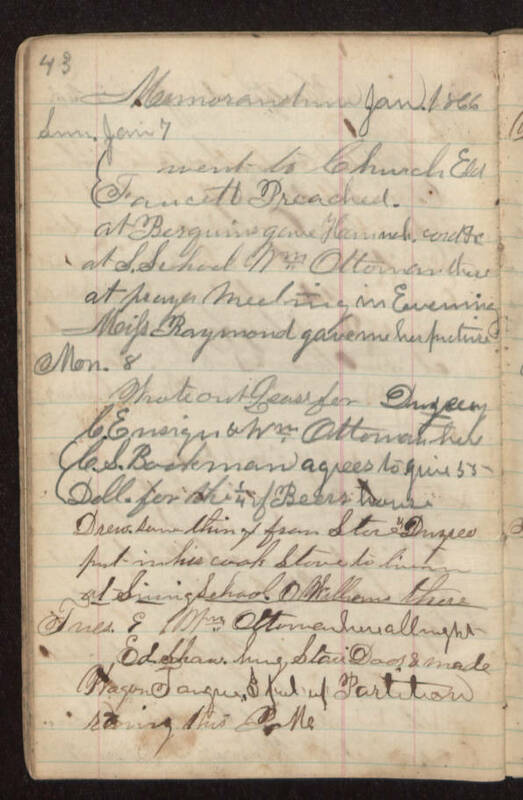 put in his cook stove to (illegible) at Singing School O Williams there Tues 9 Wm. Ottorman here all night Ed Shaw hung stair door & made Wagon tongue I put up partition raining this P.M.